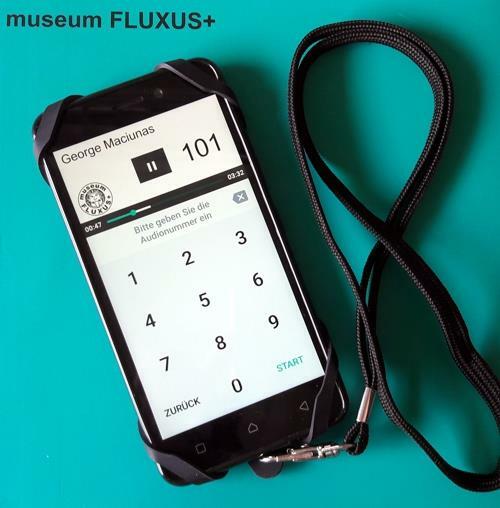 With the audio guide interested visitors can acquaint themselves with Fluxus and learn about selected artworks on display at the museum and the respective artists. Anecdotes from the collector give the audio guide a personal note offering an insight into the friendship between the collector and the artist Wolf Vostell. In the permanent exhibition and inside the atrium the audio segments are marked with numbers next to the artworks. There is no default route; visitors can take a tour through the exhibition at their own convenience. The audio guide is available in German and English and designed to be easy to handle for all visitors. The audio guide is available at the museum’s register for 2,00€. Please note that you will need to pledge an item in exchange for the audio guide.